Actor Pierce Brosnan has signed on as the narrator of Thomas the Tank Engine - a role previously taken by ex-Beatle Ringo Starr and US star Alec Baldwin. The former James Bond actor said he was "thrilled" to take part in such a "beloved" programme and "follow in the shoes of so many famous names". Brosnan will make his debut in Thomas and Friends: The Great Discovery - a DVD to be released in autumn 2008. The 54-year-old will narrate three DVD specials and three TV series. "One of my fondest memories as a father was sharing the stories of Thomas the Tank Engine and watching the series with my children when they were young," he said. 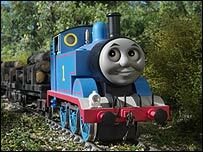 The Irish star said he was delighted to be "helping introduce Thomas and friends to many more generations of children". 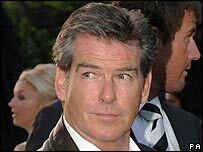 Brosnan played secret agent James Bond in four films between 1995 and 2002. He is currently in London shooting the film version of stage musical Mamma Mia with Meryl Streep, Julie Walters and Colin Firth. "To say we are thrilled that Pierce Brosnan is the new narrator of Thomas and Friends is an understatement," said Bruce Steinberg, CEO of production company HIT Entertainment. "Pierce brings a wealth of acting experience to the role, as well as a unique voice that children and parents around the world will recognise and trust." Other actors who have narrated the popular locomotive's adventures include Michael Angelis and Michael Brandon, of Dempsey and Makepeace fame. The creation of Reverend Wilbert Vere Awdry, Thomas made his first appearance in the 1945 children's book The Three Railway Engines. His TV series was first broadcast in 1984 and has since been seen in 140 countries and 25 languages.